This document will show users how to create and access the settings within a storefront. 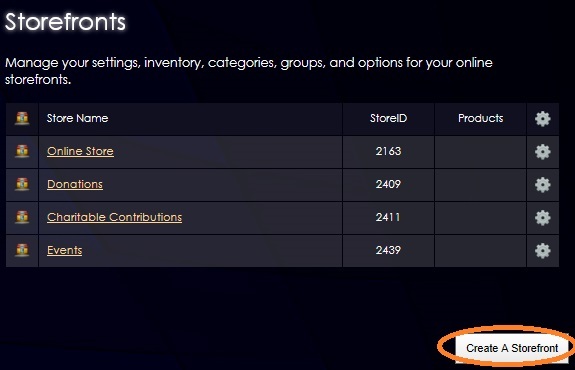 Access the E-Commerce Manager> Storefronts area and click the Create A Storefront button (see image below). Add a name for the store in the Store Name field. 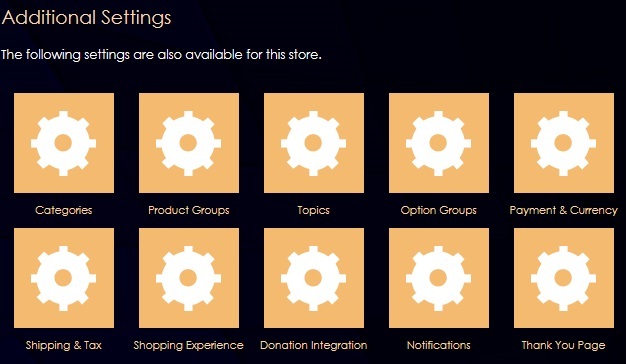 When you've finished, click Save Storefront to create your store. Shipping & Tax: Enable shipping and define your local tax rate. Shopping Experience: Format the layout your store. Image sizes, list display and product search options area all edited from within this area. Donation Integration: Control the installable Donor Panel system, which provides donors with a secure window to control their one-time and recurring giving plans. Notifications: When a new order is processed, the store can be set-up notify you. This area will allow users add the e-mail address the store should send the notification to. It also has an area where users can set-up custom outgoing order confirmation emails to customers. Thank You Page: Edit the content on the page that customers will return after completing their purchase.